Bandleaders who made recordings are shown with a red background. Click on one of the letters below if you wish to go to the any of the other pages. Name and Details Photograph Other Info. Beryl Templeman (UK/India) Singer Beryl Templeman was born in Poona and after spending most of her early life in England, returned to India just before WWII for a short holiday and stayed for seven years! She won an amateur talent contest in Bombay and was subsequently signed up by bandleader Ken Mac to sing with his band. She made about 60 recordings with the band as well as performing at top night-spots such as Green's Hotel and the Taj Mahal Hotel. She was then given her own radio show, broadcasting fortnightly over the All-India networks and becoming the Forces Favourite of the East. After a two-year tour of the whole of India, Batavia, Hong-Kong and Singapore, she returned to England, sang at one of the swing sessions at the London Palladium and then signed up to sing with Roy Fox's post-war band. Billy is also shown as the pianist in Jay Wilbur's band from October 1928 until late 1933. Wilbur directed the house band for Dominion (October 1928-March 1930), then for Crystalate (Imperial, Victory, Rex, Eclipse & Crown records). Whilst his presence on most of the Dominions and many of the subsequent records is likely, I suspect he would have little time available for "outside work" once a member of Jack Payne's band in June 1932, so his presence on Wilbur's recordings after that date must be viewed as suspect. The question remains, however as to which bands Billy Thorburn was playing with (apart from the brief spell with the revived Savoy Orpheans) between Spring 1927 and Autumn 1931. 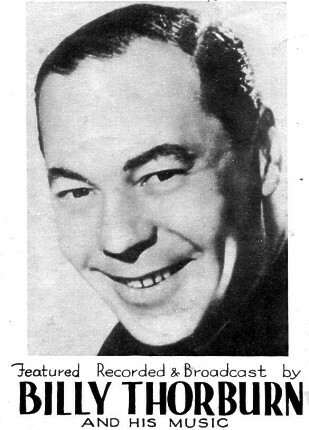 Billy's own band was usually called "The Organ, The Dance Band and Me" and was hugely popular throughout WWII and beyond, making hundreds of recordings for Parlophone. Tommy Thurban was born in London in 1874, he had a reputation to be able to play every instrument of the orchestra and was violin-leader at the Oxford Music Hall for 15 years prior to World War 1. He wrote a number of ragtime-styled pieces from 1899 and over the next few years and also a light orcherstral work "Suite Americana" which remained in the Brass band repertoire right up into the 1970s. He only made two recordings himself: two novelty ballroom pieces for Regal in 1920, with an orchestra. At the start of the 1930s, at an age when many may be considering retirement, he became Musical Director of the London Coliseum and also took a great interest in the Piano-Accordion. He started the Piano-Accordion section in "Rhythm" magazine in December 1935 and remained its technical editor until the magazine folded in 1939. Tony's Red Aces were formed in 1934 and directed by saxophonist Eddie Carney. The band was resident at Tony's Ballroom in Birmingham, which was situated behind the Hippodrome theatre in Hurst Street. The ballroom itself was on Inge Street. A contemporary report described the band as youthful and including 14-year-old Stanley Rawlings "who, besides possessing a glorious soprano voice, can play a dozen instruments." In the photograph (see right), it is believed Rawlings is the young man on the far right, sitting at the organ. . The band broadcast regularly on the BBC and made records, though these were probably not issued commercially; the family have copies and one is reported to be "Ain't Misbehavin'". The Red Aces concentrated on melody and rarely played "hot". The dance floor at Tony's was not large, but there was plenty of seating and it was quite usual to find many people, including the more elderly, just sitting and enjoying the music rather than dancing. 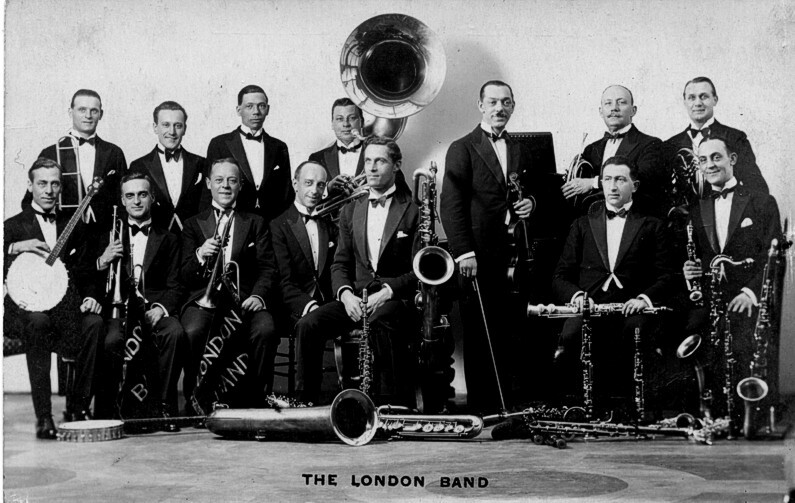 The band continued in existence until at least World War II.